Christmas 2012: It’s almost time to go! Christmas 2012…..It’s almost time to go! We have just returned from Puerto Penasco, Mexico. Everything is just about ready. These are you last minute instructions. We have 3 goals for this year. 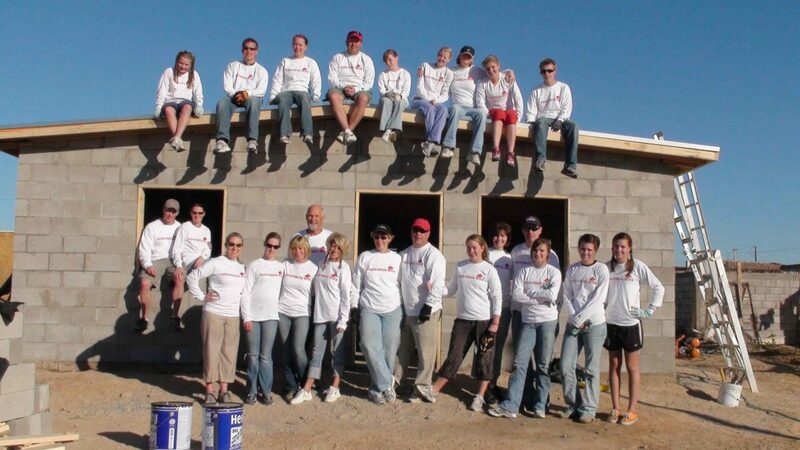 Goal #1: Raise the money for, and build three homes, while having a great time! Locals are currently pouring the foundations for three homes in two different areas of Town. Two houses will be next to each other on the west side of Town near the cardboard mall and one house on the east side near the cemetery. To make sure we are having a great time, we will work long hours, in perfect weather and meet a lot of new friends. Wednesday morning Dec 26th before we start the work, we will all meet for a quick orientation meeting at the local LDS Church at 8:00 am. The Church building is easy to find. It is across the street from the TELMEX office where the large and highly visible telephone transmission tower is located Downtown. Thursday night is our Fiesta Night. This is optional. We will gather at the Mare Blu restaurant 7:30pm and enjoy the evening. The cost is $15 per person including the live Mariachi band and great food. Please let us know at the Wednesday meeting if you will attend. Every year this is a lot of fun! Friday and Saturday the 28th and 29th met at the jobsites at 8 a.m. and we will work until we reach our building goal. Goal #2- Giving occupancy of last year’s homes to two wonderful families. This is a bonus. We have never done this during a Christmas week building project, but we are very excited about it. Here we go! Edith Fuentes has 6 children ages 19 – 6. Although her 3 young boys have helped with multiple houses ( I think “helped” is the right word) this family has no idea they will be receiving a house this year. They live in such deplorable conditions that they have nothing to bring with them to the house. In our last e-mail we shared a link so that volunteers could sign up to bring household items for this family if they so desired. To our excitement and amazement, volunteers have signed up to bring or purchase almost every item on the list. “IF” you want to help, here is the link. During the workday of Wednesday and up until noon on Thursday, anyone that wants to, can help set up the Fuentes house with the household donations. On Dec 27th at our taco lunch, we will surprise this family and present them with the house. We are not sure how this will work but we hope it will be amazing. The Lopez Family has been in our program for years and Sr. Lopez has worked on many of the houses with us to acquire his volunteer hours necessary to qualify for a home. The family is currently living next to the railroad tracks in a little shack. They will also be moving into their new home during the week we are there. Like the Fuentes family, they have very little that they can bring with them to their new house. We did not create a list of needed items for this family because we did not want to overwhelm any of you. But, as an optional activity, anyone that wants to, can help by purchasing and donating or having a group of volunteers go shopping to help this family. We will organize this at our Wednesday morning meeting. Goal #3- Christmas day lunch for people living next to the Railroad Tracks. This is Optional! For anyone that will be in Puerto Penasco on Christmas Day, and would care to help, we are planning to provide a dinner for some of the people living in shacks along the railroad tracks. This will start at 3 pm on Christmas Day. The group from Cedar City, Utah under the direction of Robert Cox is bringing six turkeys to highlight the menu. Julio Valenzuela and Don Julio’s Restaurant will provide gravy and potatoes. We will also buy and cook hot dogs, buns and anything else we can think of to serve these wonderful people on Christmas Day and to make it memorable. This is the first time we have tried to do this activity as well, but we are very excited to share this. There will be a short Christmas message and prayer before we serve lunch. We hope that Sr. Lopez will lead the way on this but if not, Ralph will deliver the meaning of Christmas thought to the neighbors. Please email us at fhfmexico@gmail.com if you would like to help or participate with this event. Don’t forget we will be in Mexico- nothing will go exactly as expected or planned. Keep calm and carry on. Don’t forget to be nice. We are all volunteering and we want everyone to have a fabulously, great experience. We are also serving each other. Be very careful. If you don’t know how to do something, please ask. I know you know this, but, Mexico does not have the same medical care as the U.S. please be very careful. Don’t forget to wear safety glasses and bring gloves to work. The inexpensive fabric gloves with plastic dots on them, from Home Depot, are the best. Bring multiple pairs for each worker. There is NOT a Home Depot there. Do not forget to wear good work shoes. You will need sun screen. You will need a hat. It will be cool in the mornings and the evenings. You will work hard but…..
1. We have received official notice from the I.R.S. recognizing “FHF Mexico, Inc.” as a 501(c)(3) tax exempt organization declaring all donations to FHF Mexico, Inc. as tax deductible. This letter will be posted on our website at www.fhfmexico.org. 2. Our Mexican non-profit corporation known as “Casas Perpetuales Parker A.C.” has been formed and is now recognized by the Mexican government. This Mexican corporation will hold legal title to the houses until final disposition is determined. It also enabled us to open an official checking account in Mexico. 3. Since last Christmas, we started and have completed 6 wonderful homes in Puerto Peñasco and completely remodeled and added onto an existing home for a Mexican couple who were blessed with quadruplets this summer. There are absolutely no administrative costs expended from your donations to FHF Mexico, Inc. The number of houses we build is determined by the amount of money raised. Please consider donating money or accommodations even if you are unable to physically be in Rocky Point this year. On November 15, 2012, we will determine the total donations received and the number of volunteers committed and, based on this information, enter into a contract with a local concrete contractor to prepare the footings, foundations and septic systems prior to our arrival at Christmas. Material orders will also be placed at this time for block and framing supplies. Unlike in years past, this year we will not make commitments and sign contracts for materials and preliminary work based on the hope that financial contributions will ultimately come in. We will only make these commitments based on the funds we actually have as of November 15, 2012. Those individuals that respond and commit to work and that have made a financial contribution will receive a follow-up e-mail informing them of the other groups traveling to Puerto Peñasco along with travel plans so those that want to can organize themselves and travel in groups. This follow-up e-mail will also include a list of small tools and other items individuals can bring for working and to donate for use in future years along with any last minute information. For those that respond and commit financially and physically to the 2012 Christmas Project, we will provide follow-up details regarding safety, travel tips, accommodations, passports, etc. Please forward this e-mail to friends and family members that may have an interest in participating (financially, physically or both) in the project. We look forward to your timely responses and to working with you in this great cause, this Christmas of 2012. We ( Ralph and Jared) have just completed the last three days of preparation in Puerto Peñasco. We inspected the two foundations on the east side of town, placed orders for block and lumber and confirmed that we have the necessary tools and equipment for our week long project. We also met with our book keeper, assessed costs to date and available funds, as well as our volunteer man power. We also made some decisions, and would like to get everyone up to speed. Bottom line is this, all volunteers will be needed. All equipment will be utilized, we will do our best to balance everything between the two sites. We plan to have 80 people on the site with two houses and 40 people on the other. That being said, if you know anyone who can still donate or if you get down here and feel even more excited about the project, more donations are always needed. 2. Equipment. We mentioned in the last email, equipment that was needed. Those of you who were planning to bring or donate a ladder or wheelbarrow, please do so. However, please don’t go buy one of those things this week as a Christmas Gift for your spouse because you think we need one. We should be fine. Everything else requested in the last email is the same. 3. Fiesta. The group party “Fiesta” is scheduled for Wednesday December the 28th at the Mi Familia Restaurant at the Reef. (upstairs from Mare Blu). Here is the link for the location: http://maps.google.com/maps?f=q&q=31.327019,-113.602692 The cost will be $10 per person. This will include dinner and the mariachi band. Please get your money to Ralph or Jared Tuesday morning, or as soon after that meeting as possible so that we can have an accurate count and can make arrangements for the food. 4. Opening Meeting. The opening meeting will be at the LDS church in Puerto Peñasco on Tuesday the 27th at 8:00am. The church is located just north and across the street from the large red telecommunication tower which is east of the main road. http://maps.google.com/maps?f=q&q=31.317697,-113.537583%20%28Carretera%20Sonoyta-Puerto%20Pe%C3%B1asco,%20Puerto%20Penasco%20SO,%20Mexico%29 If you are concerned about finding the church, a group of volunteers will be departing the Las Palomas entry gate about 7:45-7:50 to go to the meeting. It is important to attend this meeting. We will have a short devotional, instructions about safety, make assignments to the houses, designate the construction leader for each house and meet the recipient families. We need a piano player that morning so please don’t hesitate to volunteer your talent. 5. Weather. This past weekend the weather was beautiful for two days with a high of 66. The third day it rained hard, and was unusually cool. Please prepare accordingly. 6. Group Travel. For those wishing to join the caravan from Phoenix on Monday, December 26, 2011, to cross the border and travel with a group to Rocky Point, we are meeting in the parking lot of Walmart just behind the In-N-Out Burger at the northeast corner of I-10 and Dysart at 11 a.m. See the following link: http://maps.google.com/maps?f=q&q=33.459530,-112.339340 We will leave shortly thereafter. 7. Insurance. We strongly urge you to purchase your Mexican vehicle insurance online before you leave. If we have to wait for everyone to buy insurance in Ajo, It will significantly delay our approval in Rocky Point. 8. Prior E-Mails. Please reread the prior e-mail and take the time this week to make sure you have the gloves, safety glasses and miscellaneous items we asked you to bring with you for the project. We are anticipating a fabulous year. You will make new and lasting friendships and discover the joy of the Christmas season serving other. Thanks to many of you, the 2011 Christmas house building project is well under way. Two weeks ago, Jared and I went to Rocky Point to get things started for this year. We determined that the lot we have is large enough to build two houses on it and we received enough early financial contributions to pay for the foundations and septic systems to be constructed. This work has been done and should be finished by mid-December. The lot is located about one mile east of Boulevard Dominquez;. We have also met with the two families that will be the recipients of the houses Sergio Lopez and Abraham Martinez. As of today, we have received actual donations in the amount of approximately $31,000. Based on this contribution amount and having confidence that the rest of you will make your contributions soon, we have committed to building two (2) houses this year. This means we need to raise at least $20,000 more within the next couple of weeks. If you haven’t already done so, please mail your contribution check toFHF MEXICO, INC., and mail it to Ralph Pew, 1744 South Val Vista Drive, Suite 217, Mesa, AZ 85204. As of today, we have received confirmation from 16 families that they will be in Rocky Point between Christmas and New Year’s to work on the houses. Of these families, there will be approximately 65 volunteers available for work. 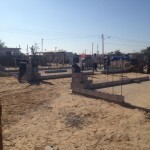 We will need about 85 volunteer workers each day from December 27thto December 31st in order to complete the two (2) new houses. Accordingly to the e-mails we have received, the following families have confirmed their participation in the project this year: Barnes, Brady, Bishoff, Dalton, Fackrel, Finlayson, Hafen, Jacobson, Lake, Nyland, Parker, Parrish, Pew, Porter, Price and Scoresby. If this information is inaccurate and you are committed to be in Rocky Point, please e-mail me as soon as possible. We have two (2) families that are tentative commitments: McAllister and Sobotka. The weather between Christmas and New Year’s is generally cool and sometimes windy. Bring layers of clothing to work in. It will be cool in the morning, mild to warm during the day and cool after the sun sets. The first three days will be dirty. We will be working with concrete and block and it is very dusty and messy. Please bring gloves. The fabric gloves with plastic dots on them work best. Everyone will want to have multiple pairs. You could easily use a pair a day per person, more if you don’t keep track of them. They are inexpensive. Please bring and wear safety glasses. Dust and sand are miserable in the eyes and it is easy to prevent. Hats are a very good idea. We highly recommend them as well. Don’t be fooled by the cool weather. The sun will be bright and can cause sunburn. · Two inexpensive aluminum 24-inch levels. Please contact either Ralph or Jared and let us know if you can obtain or donate any of these larger items (used would be fine). If you cannot transport them to Rocky Point, we have trucks and trailers coming down that can carry the items. Jared and Ralph are making another trip to Rocky Point Thursday afternoon, December 15th, and could transport these larger items if you can deliver them to Ralph’s house before then (1757 East Indigo Street, Mesa, AZ 85203). We have arranged for discounted “owner” rates at the Las Palomas Golf and Beach Resort. If you have not already made your housing arrangements, please contact Jared Parker or you can call Ivan in reservations at Las Palomas direct. (+52 (638) 108 1000). Tell him you are with the Parker Pew group that is building the Christmas houses, and that you want to book your room at the “owners rates”. Ocean view are less than ocean front. Each family is responsible for their own food and water. There are lots of Mexican taco stands and other places to eat and snack for lunch located near the site. 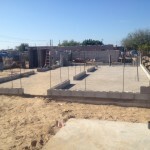 The work site is about 15 minutes from the Las Palomas Resort and the RV park on Sandy Beach. Three grocery stores are close by. Families can make their own dinners or many families enjoy going out to dinner and experiencing the quaint authentic Mexican restaurants in Rocky Point. You will want to bring drinks, water and snacks to the job site for your family each day. · Don Julio’s: Traditional Mexican food. It is in the old Hacienda Las Fuentes location. · Mare Blu: Italian food, along with steak and seafood, located at the reef. · Mary’s Seafood: Casual, located on the Malecon. · Lukas Chicken: Casual, inexpensive, always good. · Taco Brissa: Great tacos and papa rellenos. Inexpensive and good. · Xochitl’s: Great breakfasts and tortilla soup, located at Choya Bay. · Rossi’s: Reasonable for breakfast, lunch and early dinner, located at corner of Constitution and No-reelection. · Flavios: Mexican food, located on the Malecon. · Street hot dogs: Look for the “chili dogo” or the bacon wrapped dog with Pico, lime or jalapeno mayo. · Friendly Dolphin: Mexican food with great old Mexico décor, located on the Malecon. · Ramon’s: Mexican food cooked Chef Ramon. For the convenience of all volunteers, there are gas stations/convenience stores within short driving distance from the job site that have bathrooms. The Fiesta is going to be Wednesday evening, December 28th. We are finalizing plans for the location. The cost will be between $10 to $15 per person. There will be food, live music, dancing and lots of fun. This Fiesta is always the highlight of the week providing a chance to mingle with fellow volunteers, enjoy good food and music. We will need to get a commitment and collect the money from those who will attend the Fiesta when we meet on Tuesday morning to start the project. This way, we will make sure that there is enough money to buy the food and pay for the mariachi band. Tee shirt orders will be finalized December 10th. The shirts are long sleeve tees and are $15 each. Contact Jared Parker for any other questions you have about tee shirts. We can get youth and adult sizes. Prior to commencing work on Tuesday, December 27th, we will all meet together for a short devotional, safety instructions and work crew assignments. We will meet at 8 a.m. at the LDS church building in downtown Rocky Point. The building is located directly north of the cell tower for the phone company in downtown Rocky Point. We will keep you notified of further information as it becomes available. 1. All the houses that have been built over the past several years are now completely finished. 3. By the end of October, our Mexican non-profit corporation known as “Casas Perpetuales” will be formed and this Mexican corporation will hold legal title to the houses until final disposition is determined. Because of news reports concerning violence in Mexico, we receive inquiries each year as to the safety of traveling to and spending time in Rocky Point to work on this project. In more than eight (8) years of this Christmas endeavor, our volunteers have not experienced any violence or threats to their safety. Many of us travel to Rocky Point multiple times during the year and have not had any problems. Random acts of violence could occur any time and any place in the United States and/or Mexico. Many of the volunteers have coordinated their travel schedules so that they can travel in groups from Lukeville, Arizona to Rocky Point. We will attempt to facilitate this as we received confirmations as to when people are traveling to Rocky Point. Use common sense, be aware of your surroundings and travel during daylight hours seem to be good guidelines to follow. This year, if we receive $85,000 in contributions and 80-90 (5-day) commitments for volunteer labor, we can build two (2) new houses and complete the shell framework of a home that can be used in the interim for storage purposes. To insure a successful effort, we want to let everyone know the proposed schedule, dates for work and donation goals. At the same time we need to find out from all of you the number of volunteers and amount of financial contributions we can expect. To buy the land and build one house requires approximately $32,000 and 1200 volunteer man/woman hours. That is about 25 to 30 people working full time, for 5 days during the Christmas holiday to block up a home, frame the roof and interior walls, and apply the roofing material. The balance of the donated money will finish the house over the next couple of months. The sacrifice in time and money made by those participating in the work project is worth every minute and every dollar spent in helping others and experiencing the satisfaction of giving in a tangible way. Many lives have been changed. The families in Mexico have safe and durable housing, and families from the United States make lasting friendships, feel the joy of charity, and experience the true meaning of Christmas. 4. The amount of money you will contribute. A good suggestion would be $1,000 per person or $3,500 per family, but any donation of time, money, or accommodations, is very much appreciated. Remember, every penny donated goes directly to purchase material (brick, mortar, windows, etc) for these houses. There are absolutely no administrative costs expended from your donations and FHF Mexico, Inc. The number of houses we build is determined by the amount of money raised. Please consider donating money or accommodations even if you are unable to physically be in Rocky Point this year. In the past, some individuals have sent out letters to family and friends soliciting contributions and others have created fund raising projects. Many have made contributions by donating what they would have spent on Christmas and making the financial contribution and labor their Christmas gift to others. We are ready to begin purchasing materials and contracting for the foundation and septic work to be completed. Please don’t wait until the last minute to donate or commit to help because this makes it very difficult for us to coordinate the work of the project. This year Jared and I would like to have all the money contributed and in the bank account by November 15, 2011. We will then go to Rocky Point and purchase all the building supplies and materials and store them for the project so that we will not have to scramble every day during the work project to make sure we have materials and equipment to work with. Please send your financial contributions for the house building project as close to November 1, 2011 as you can. Checks should be made payable to “FHF Mexico, Inc.” and mailed to Ralph Pew, Pew & Lake, PLC, 1744 South Val Vista Drive, Suite 217, Mesa, Arizona 85204. Those of you living in the Salt Lake City area, who would like to, can hand deliver or drop off donations to Jared Parker, 1955 Laird Drive, Salt Lake City, UT, 84108 Because we have recently formed a new Arizona non-profit corporation known as FHF Mexico, Inc., your donation may be tax deductible. We are working on processing the qualified exemption application with the IRS and, while we await final determination from the IRS, there is a remote chance that the IRS may not grant us tax-exempt status. WE have been advised that it is extremely unlikely that this will happen, but the risk does exist. We will keep your information on file and provide you with our IRS determination letter (501(c)(3) status) when received. Each year we make a nice, good quality, long sleeve t-shirt for participants. Everyone loves them and wears them proudly. Please e-mail your order and sizes to tjaredparker@msn.com and mail your check for the shirts to his address above. The price is $15 per shirt. Once again, don’t wait. If you want the shirts, please order and pay for them now. At this time, we will determine the total donations received and the number of volunteers committed and, based on this information, enter into a contract with a local concrete contractor to prepare the footings, foundations and septic prior to our arrival at Christmas. Material orders will also be placed at this time for block and framing supplies. Unlike in years past, this year we will not make commitments and sign contracts for materials and preliminary work based on the hope that financial contributions will ultimately come in. We will only make these commitments based on the funds we actually have as of November 15, 2011. Those individuals that respond and commit to work and that have made a financial contribution will receive a follow-up e-mail informing them of the other groups traveling to Puerto Peñasco along with travel plans so those that want to can organize themselves and travel in groups. This follow-up e-mail will also include a list of small tools and other items individuals can bring for working and to donate for use in future years along with any last minute information. Volunteers will begin arriving in Rocky Point on Christmas Day and Monday, December 26th. Construction will begin on Tuesday, December 27th and continue through Saturday, December 31, 2011. Work starts at about 8 am each day and goes until around 4:30 p.m. We will all meet together Tuesday, December 27th, at 8 a.m. in the LDS Church building in Rocky Point for work project assignments and safety instructions. The follow-up e-mail will contain directions to the church building. “Welcome Party” and get to know you fiesta beginning at 6:30 p.m. at the La Familia restaurant. Our follow-up e-mail will provide directions. The food is always great, we will have a lot of fun and there will be a live mariachi band with dancing. We estimate that the cost for the food and entertainment will be $15-$20 per person. It would be very convenient and helpful in buying the food and paying for the band if those of you that want to attend the “Welcome Party” could let us know how many people from your group will be attending the party and bring cash for payment to our kick-off meeting on Tuesday morning, December 27, 2011. Depending on the interest and remaining energy, we could plan a New Years Eve Party? We’ll gauge interest in this as the week progresses. Volunteers typically secure accommodations in beach front homes in Las Conchas, Cholla Bay or in one of the resort condominium projects along Sandy Beach. 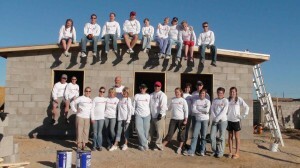 In the past, it has been very fun to have as many volunteers stay in one location as possible. Generally, most volunteers have been very pleased with the accommodations at “Las Palomas Beach & Golf Resort.” The website for Las Palomas is reservations@lppmc.com and if you want to find other housing options, try http://www.seasidemexico.com. This company manages homes and condos in Rocky Point. For those that want to stay at Las Palomas, please indicate that when you notify us by November 1, 2011 of your intent to participate in the project and contact Jared Parker at tjaredparker@msn.com and (801) 860-8686 and he will coordinate with Las Palomas a group rate. Passports work the best for re-entering the United States from Mexico. A passport card is also an option. Please check cbp.gov for additional information, and get your documentation soon! Do not wait on this one. Passports are easy and relatively inexpensive to obtain. If you start now, you will have your passport in time for the project. We look forward to your timely responses and to working with you in this great cause, this Christmas of 2011.